After some 12 fake "pipe bombs" were sent last week to top Democrats and the very real terrorist attack on the Tree of Life Synagogue in Pittsburg by a deranged anti-semite, it is time for some serious soul searching and also re-evaluate our own strategy and tactics. Democrats and the liberal media continue their blind demonization of President Trump, like dysfunctional juveniles projecting all responsibility on their opponents. They are incapable of introspection and self assesssment, because that requires an objective moral standard, which they purposely destroyed years ago. The editor of present blog yesterday decided to stop posting on so called free speech platforms. While the right to free speech is a wonderful thing, it comes with an obverse side: responsibility. Libertarism is great, but its followers tend to see rights detached from context. In this instance they failed to control Jew haters and assorted lunatics, letting them run riot on their platforms. GAB is not going to survive. Thomas Wictor explains. We second his feelings entirely. Update: Wictor can't livestream, hits Facebook instead (tweet). Gab literally KILLED itself because it allowed people calling for violence & genocide to run all over their site. It was a truly stupid thing for them to do, and hopefully people who want to run social media platforms learn from their example. Al Sharpton openly calls infront of a room full of people for hate against the Jews. Bill Clinton and other democrats proudly associate with him. Iran openly calls for the death of the Jews and Israel and Obama and other democrats proudly stand up for them. Trump supports Israel. Is it Cesar Sayoc or Cesar Sayoc Jr.? This smells like a setup. The 56 year old is a Democrat, while Jr is a Republican Trump Supporter! Oct. 14, 2018 Mark Levin talks to investor and economist George Gilder. 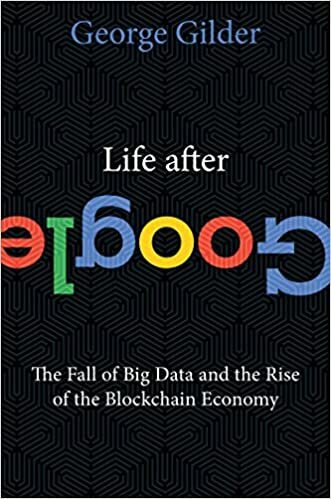 George Gilder is the author of Life After Google: The Fall of Big Data and the Rise of the Blockchain Economy. He has a very positive outlook about the direction of technology in general and the Internet in particular. He explains on a philosophical basis why the Silicon Valley guys are not capitalists, but postmodern Marxists. This is the reason their best time is over and the future looks much better than the present social media ghetto. Gilder is an American investor, economist and co-founder of the Discovery Institute. His 1981 international bestseller Wealth and Poverty advanced a practical and moral case for supply-side economics and capitalism during the early months of the Reagan administration and made him Ronald Reagan's most quoted living author. (...) whatever else it may be, Google is not an American company. "Google" is, more than anything else, a logo and a marketing label; it is also a subsidiary of a holding company called XXVI, which is in turn a subsidiary of Alphabet Inc., a corporation that is also an umbrella for a number of other venture capital and research entities. For another two years, until the deadline imposed by an Irish court expires in 2020, Google or Alphabet or the Money Machine or whatever you want to call it will continue to steal from the rest of us by means of two accounting schemes known as the "Irish Double" and the "Dutch Sandwich." ⏩ Google is now going full hard totalitarian. Google co-founder Sergey Brin -- the tenth richest man in the world, with a Donald Trump-dwarfing net worth of 52.9 billion dollars -- was extremely depressed by the election of Mr. Trump, as seen in a video just surfaced by Breitbart. He compared the president's supporters to "fascists" and claimed they voted for him out of "boredom," of all things. (...) Larry Page -- Brin's partner in otherworldly entrepreneurial success, making him even richer than Sergey -- refused to show up for a congressional hearing that principles of Facebook and Twitter did attend and answer questions. Meanwhile word of Google’s plans to substantially expand its currently minimal role in the Chinese market—through the potential launch of a censored search engine code-named Dragonfly—has provoked such uproar. [bold mine] The plans were revealed through documents leaked to the Intercept, which reported that prototypes and negotiations with the Chinese government were far along, laying the groundwork for the potential service to launch as soon as early 2019. Here's the latest from Twitter: turns out, before his hearings with the US Congress last week in which his general attitude was "whatever are you talking about?" when roasted about Twitter's bias, Jack Dorsey admitted that more Conservative minded employees are afraid to speak their minds! Fox News reported on Monday night that an email from a senior-level Google employee, Eliana Murillo, revealed that she used company resources to increase voter turnout in the 2016 election in a manner that she believed would help Hillary Clinton win. THE NEW FEMINISM: GET A F**NG PERSPECTIVE!